A lighter take on double chocolate muffins. 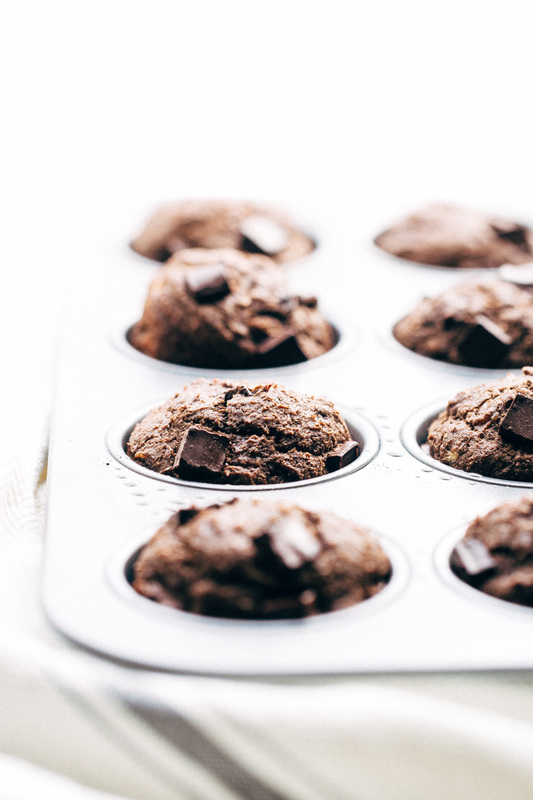 These chocolate banana muffins are made with whole wheat flour, greek yogurt for tenderness and are mostly sweetened with ripe bananas! Gimme all the chocolate! ?? 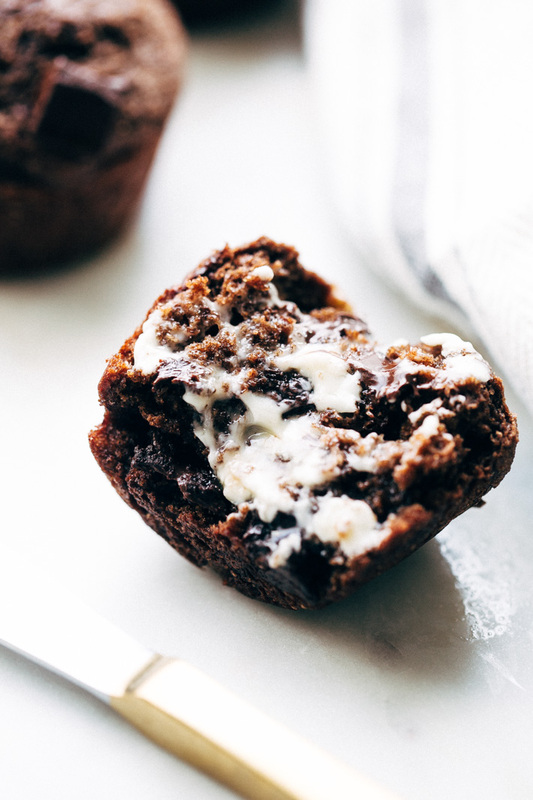 Especially when it comes in the form of tender chocolate banana muffins that are pillowy soft, loaded with two kinds of chocolate, made with whole wheat flour, and greek yogurt for an added protein punch. ?? These muffs disappeared in a flash and the best thing I heard? They didn’t even taste healthy! Guys, this literally makes my entire week. 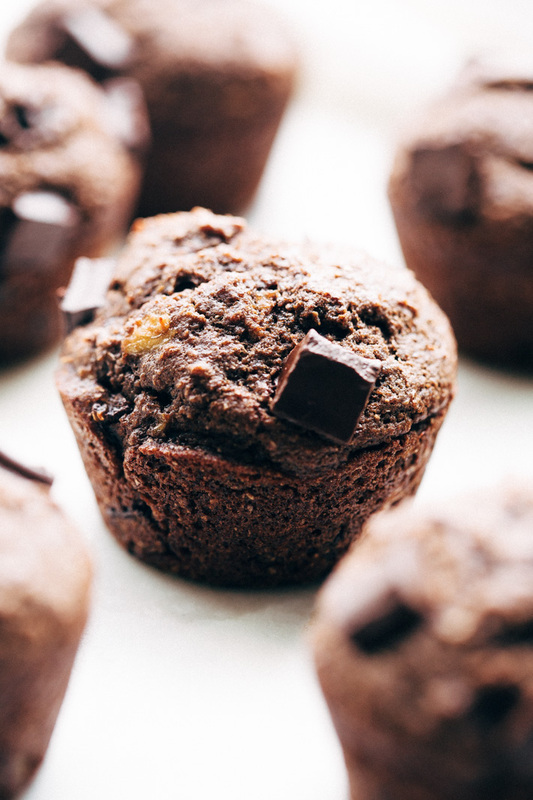 To be able to produce a muffin that’s tender, chocolatey, and contains no butter but can still be passed off as a regular, full-fat chocolate muffin. Music to my ears. ? It’s about that time when we’re all feeling a little down from the struggles of new year resolutions. Can we agree that the mid January blues is a thing? As i’m writing this (a week before you’re reading this), it’s been raining nonstop in Houston and we’ve got flooding everywhere. So excuse me while I wrap myself like a blanket burrito, hit ‘snooze’, and pretend the gym doesn’t exist thing morning. Friends don’t judge friends. The perfect cure to all of our problems? 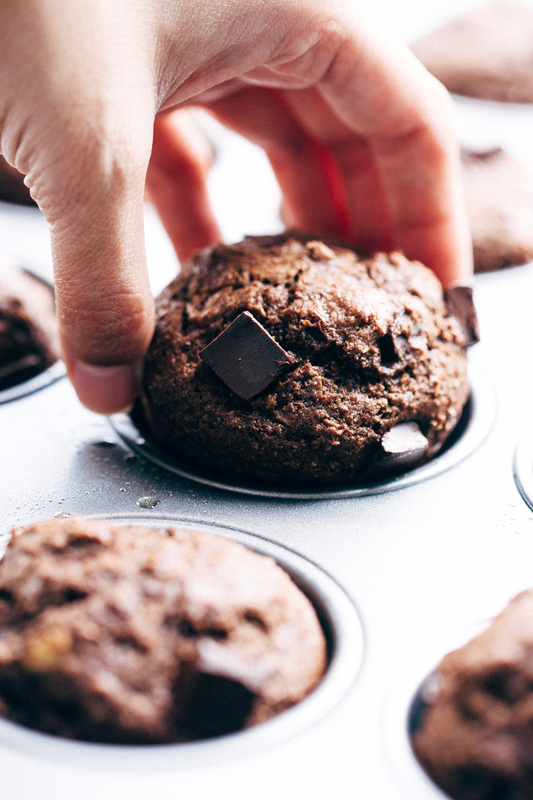 A homemade lighter double chocolate banana muffins. [Healthier] baked goods make everything better. HEALTHIER: You know how you committed to eating healthier meals this year and dessert just needs to be worked back into this healthier meals routine? Hi! I’ve got your dessert/ handy breakfast fix right here. These are made with 100% whole wheat flour and pack on 4 grams of fiber per muffin. Each muffin contains almost 5 grams of protein to keep you fuller and and and there’s absolutely no white sugar in these muffins at all. SCORE. QUICK: When it comes to January, i’m all about quick/easy/fast meals. So excuse me if I don’t want to spend hours slaving away at the stove or err.. oven? These muffins are a breeze to whip up and the best part is you don’t even need a mixer. That means, grab two bowls, mix your dry and wet ingredients separately and then combine. NOT ANOTHER BREAKFAST SMOOTHIE: Is it me or everyday January we get bombarded with a million and one different shades of green smoothies taking over our Instagram feeds? I mean yeah, I like greens and fruit as much as the next person but what about the concept of a WARM BREAKFAST? The internet is shaming us all into believing that drinking our fruit in the form of a cold smoothie is the only way to do it. Why can’t we just make muffins instead? 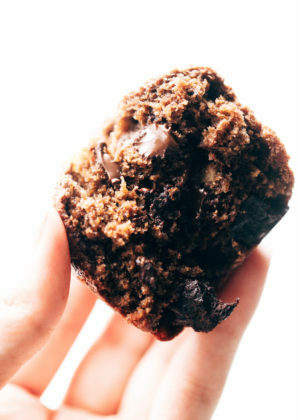 Okay, if you’re going to hesitate about the chocolate chips, i’ll tell you that you can easily swap them out for chopped pistachios or walnuts but then you’d be making the conscious decision to make double chocolate banana muffins with a single form of chocolate but no need to worry, they’ll still be great. And just like that, we have ourselves the perfect lighter dessert / breakfast / if you’re my husband you’d call this breakfast dessert, option. But whatever you decide to call it, know that it packs a little boost of good calories, healthy fats, and yeah chocolate chips. That’s an essential food group too, you know. Position a rack in the center of the oven and preheat the oven to 350ºF. Spray a muffin pan with nonstick cooking spray, set aside. In a large bowl, combine the flour, cocoa powder, baking powder, baking soda, salt, and ground cinnamon. Whisk until just combined. Set aside. In a medium bowl, whisk together the egg, light brown sugar, greek yogurt, vanilla extract, mashed bananas, and coconut oil. Slowly pour the wet ingredients into the dry ingredients.Gently begin to fold it all together. Work out any flour pockets but do not overmix the batter. Fold in the chocolate chips. Divide the batter between 12 muffin tins, filling ¾ of the way up the tin. Bake the muffins for 18 – 22 minutes or until a toothpick inserted in the center of the muffin comes out with just a few crumbs. Allow muffins to cool completely. Muffins remain fresh and moist stored at room temperature for up to 3 days or in the refrigerator for 5 days. Muffins freeze well, up to 3 months.